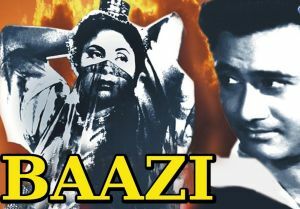 Baazi is a 1951 Indian Hindi film directed by Guru Dutt.Dev Anand’s Navketan production house produced the movie, and as per a commitment given by Dev Anand to Guru Dutt in their days of struggle, the movie was directed by Dutt.The movie stars Dev Anand with Geeta Bali and Kalpana Kartik.It is a crime thriller and had very popular music composed by S.D. Burman.The film is a tribute to the Forties’ Film Noir Hollywood with the morally ambiguous hero, the transgressing siren, and shadow lighting.It was very successful at the box-office. Madan comes from a poor family background.Unable to find employment, he takes to gambling in a big way.He makes a lot of money, and decides to open a gambling den, where he makes even more money.He meets with sophisticated and cultured Dr. Rajani, and both are attracted to each other.But Rajani’s dad does not approve of Madan nor of his background, and would prefer that Rajani marry Inspector Ramesh. Rejected, Madan meets with vivacious and outgoing Meena, and romances her. Then Inspector Ramesh arrests Madan and imprisons him for the murder of Meena, who was killed with a revolver with Madan’s fingerprints on it.The shooter intended to kill Madan, but Meena protected him & was killed instead.Rajani’s father ordered the killing because he didn’t consider Madan suitable for his daughter.Rajani’s father threatens Madan that he will kill his sister if he says anything.Madan keeps quiet & is sentenced to be hanged at 6 am.Inspector Ramesh finds some evidence that it wasn’t Madan who killed Meena. Rajani’s father is imprisoned & Madan is freed. This was Navketan’s second production, after “Afsar”.Dev Anand, the Producer, gave chance to Guru Dutt to make his directorial debut.The story of an urban unemployed youth taking to crime because of circumstances, has excellent performance from Geeta Bali and equally unforgettable music by S. D. Burman, who experimented with the Ghazal format, in its orchestration, for the first time with the song “Tadbeer se bigdi hui taqdeer bana le”.With this film Dev Anand picked up his style, which were to keep him on top, alongwith Dilip Kumar and Raj Kapoor, for decades to come.